Hey guys!! 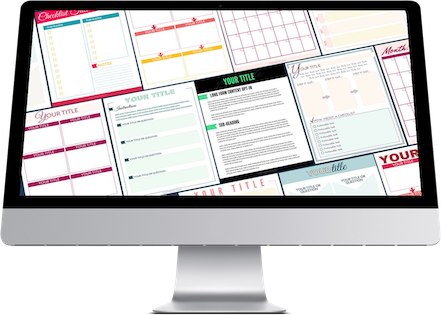 I get a lot of frequent question about resources and tools to use for the templates in our complete blogger template toolkit, so I thought I'd put together a page dedicated to answering those questions! Most of these are affiliate links, but they are all products and resources I use, love, and 100% recommend 🙂 Enjoy! This is how I make 3D covers-- my absolute favorite resource, amazing for making your digital products look like real workbooks! Great for finding fonts, clip art, and other design elements to help your graphics stand out! Great for finding premium fonts if you are needed your own brand font to help set your templates apart! You've got the pins, what about the strategy? Pinterest Traffic Avalanche is my recommended course for traffic growth through pinterest! You've got the lead magnets, what about the strategy? List love is my absolutely FAVORITE list builidng course (by a long shot!! ), by Simplifying DIY Designs 7th month of being live we were getting over 1k sign ups per month!